Lady Jester from Novomatic is a lovely slot game. Normally court jesters were male, especially in medieval times. That’s what makes this game so special as the jester in this game is a beautiful lady! Sometimes they were called fools as they acted very foolish indeed! Jesters were employed by Kings and Queens right up until the 18th century – at least in England. In other parts of the world, Jesters were still employed up until the 20th century! Jesters were popular and loved by royal families in Russia, Germany, Italy, Spain, France, Poland, Canada, Germany, Japan and even Tonga! They entertained their royal employers and their companions by acting foolish and making them laugh! Jesters would do tricks, dance, sing and make jokes. Kind of like a stand-up comedian crossed with a clown. The jester in this game is dressed up in costume but it seems like her main role is to be beautiful not funny! 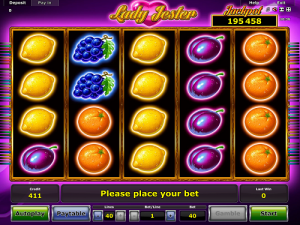 Lady Jester by Novomatic is a slot game with an RTP of 94%. It has forty paylines that run from left to right across five reels. Each of the five reels has four positions. Lady Jester has gamble, autoplay, scatter symbols, wild symbols and free games. Fruits n Royals, Plenty of Fruit 40, Sizzling Hot Deluxe and Magic 81 Lines, also by Novomatic, come recommended if you like Lady Jester! The top selling point of this slot, though, is that Lady Jester has a massive progressive jackpot! As with almost every Novomatic online slot, Lady Jester has a paytable. The paytable is very useful as it shows you each symbol in detail as well as the wins they give. The wins are displayed according to how many matches you get and what your bet is. You can easily change your bet (if you are playing manually, not automatically) by choosing how many of the 40 lines you want to play with and then choosing how much to bet on each of the win lines. Most symbols in this game give payouts for matches of three or more, except for the lowest-paying symbol and the highest-paying symbol, which give payouts for matches of two or more. The cherry symbol is the least valuable and the Lady Jester is the most valuable symbol. Other symbols include: plums, oranges, green bars, watermelons, grapes, lemons and red sevens. You’ll want to keep your eye on the left of the screen as matching symbols have to fall consecutively from that side. Also, on the paytable you’ll find a page showing all of the win lines. Have a look here to see which patterns the matching symbols have to fall on. Remember that they only pay from the left and matches must be consecutive. More than one win line can pay each spin, if you cover it! The gamble game is all about timing in Lady Jester. If you’ve got quick fingers, give it a go when you get a win and you’ll have a 50% chance of doubling your bet! You can win the Lady Jester Jackpot during the Free Games in this Novomatic jackpot slot! To trigger the Free Games (you get 15 at a time), you need to spin three Scatters. These also give payouts for matches of 3, 4 and 5 symbols. Scatters can land anywhere they please – paylines mean nothing to these bad boys! The Lady Jester is the Wild symbol and can replace any other symbol in a winning combination. They appear in the ordinary game and they also appear in the Free Games! Except in the Free Games, when this beautiful lady turns up on the reels, she works her substituting magic and then expands to cover the whole reel and stays there for the next spin to work even more magic and give you even more wins! If you spin a Lady Jester symbol on every reel during the Free Games and they expand to cover the entirety of all the reels, you’ll win the jackpot!